Professor X To The Rescue! In the early days of the X-Men, and really for as long as he held the reins of his original team, Charles Xavier maintained a no-nonsense relationship with his students--giving his young charges their space when necessary, but cracking the virtual whip when it came time to practice the use of their powers. Yet, Xavier was more of a teacher than an authoritarian, and there seems little doubt that his students respected him not only in that role but also as a father figure, one who seemed with them at all times. Even on missions in the field, where normally being confined to a wheelchair would limit his involvement, Xavier's mental powers allowed him to not only continue to supervise his students but, in many cases, to direct their actions. It was an approach which seemed to work. The X-Men, while learning to act independently, still needed and depended on their teacher's experience, knowledge, and resources to help them navigate and deal with the forces they encountered. 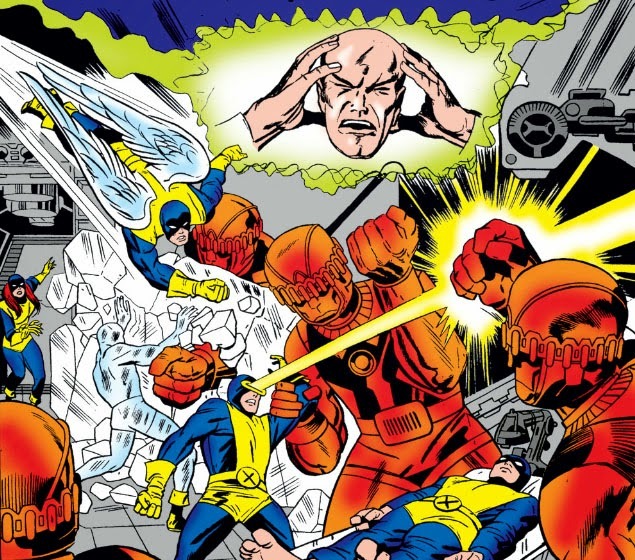 Not long after the "new X-Men" replaced the original members, circumstances arose which effectively separated Xavier from any involvement in the X-Men's activities, as well as their evolution as a team. Eventually, Cyclops, Storm, Wolverine, Nightcrawler, and Colossus were reunited with Xavier--but the man who was once mentor and teacher soon found that stepping back into his former role was no longer feasible, his old methods of harnessing and instructing teenagers in the early stages of developing their powers inapplicable with grown people who were already well-versed in the use of their abilities and had, in effect, gone on to become a team without his guidance. It was a realization that, at first, he rejected outright. Eventually, Xavier adapted to the new X-Men, and they to him. But as his role with them continued to diminish, it became clear that in order for him to thrive once more in the role of teacher, as well as the figurehead of a school for mutants, he needed new students--and so, with the "New Mutants," Xavier was able to start over, becoming father figure, mentor, and instructor to children who needed his guidance and discipline. It wasn't quite the same, of course, since these kids weren't content to be on as tight a leash as Xavier kept the original X-Men; but that would be a learning experience for Xavier, as well, and he would again adapt. Circumstances would once more arise which separated Xavier from the school (and you can't get much more distance than being with the Starjammers); meanwhile, the New Mutants would become lost in time, attempting to flee Warlock's evil father, Magus. (Try to ignore the similarity of these names with other Marvel characters.) When Illyana Rasputin--"Magik"--manages to reach Xavier with word on their predicament, events in the 50th issue of New Mutants are set in motion which would give us a vivid idea of how deeply Xavier regards his commitment to his students, and how effective these kids can be with the right person in charge of the lessons. It was a dark kingdom that both we and the Sub-Mariner left behind after the story of the Brethren was concluded with that alien race's slaughter by the Atlanteans, who mistook them for enemies. In Prince Namor's absence, Atlantis had been embroiled in conflict with the hordes of the barbarian Attuma, who no doubt considered the kingdom ripe for conquest with its powerful figurehead having abandoned it. Returning from yet another battle, Atlantis' soldiers made all the wrong assumptions about the Brethren, taking no chances--and leaving no survivors. And Namor, faced again with an Atlantis in turmoil, headed out once more to open sea. Yet he hasn't wandered far from the city, and can't help but note the cloud of guilt and grief that now clings to its people. But, unknown to all, there was a survivor of the massacre, one who fortunately wasn't present when the Atlanteans descended on the Brethren with swords drawn. The Brethren had left their women behind on their world while they searched for sanctuary on another; but they carried a stowaway, one who now approaches the city of her race's murderers. It isn't long before word spreads of Namor's arrival, and he and Vashti meet to discuss Tamara's situation. Their sympathy toward her as well as their earnest efforts on her behalf are almost enough to sway her from her plan of vengeance. Almost. This story isn't helmed by Dan Adkins and Mike Friedrich, who respectively plotted and wrote the prior issue dealing with the Brethren tragedy; instead, we have Bill Everett and Gerber filling those respective roles. 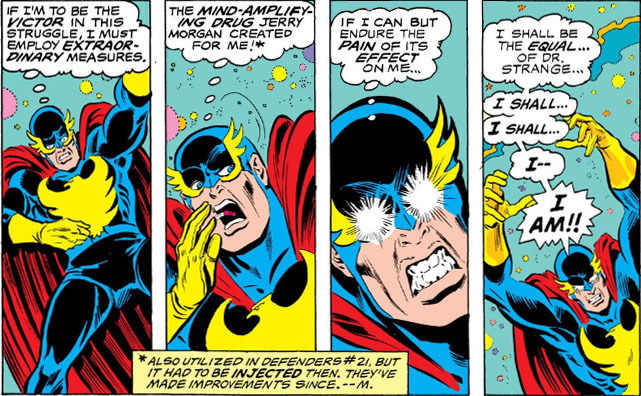 But as we'll shortly see, it seems they're on the same page with Adkins and Friedrich as far as things taking a turn for the worse whenever Namor feels it's a good idea to again abandon his kingdom. It was just over a year and a half ago when I made a brief entry on the 1978 Silver Surfer graphic novel by Stan Lee, Jack Kirby, and Joe Sinnott, and hopefully those who came across it were intrigued enough to seek out this classic work and feast their eyes and imagination on (as the cover puts it) "the ultimate cosmic experience." It's still a work I remember fondly, the last great collaboration between these "Bullpenners" before Kirby would take his second and final leave of Marvel Comics. You could almost see the Surfer from his vantage point in Earth orbit, seated on a small piece of rubble and glancing down with those distance-piercing eyes of his, noting the turning point that was taking place in both Marvel history and his own. 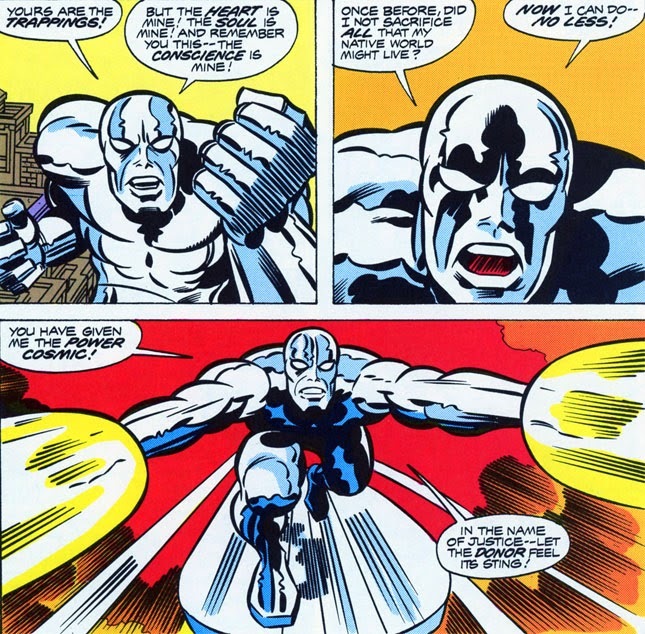 Four years after Lee and Kirby's story, artist John Byrne would join with Lee to craft another stand-alone Surfer tale, though it wouldn't be the 114-page behemoth of the '78 book--yet in its own way it has just as much scope. 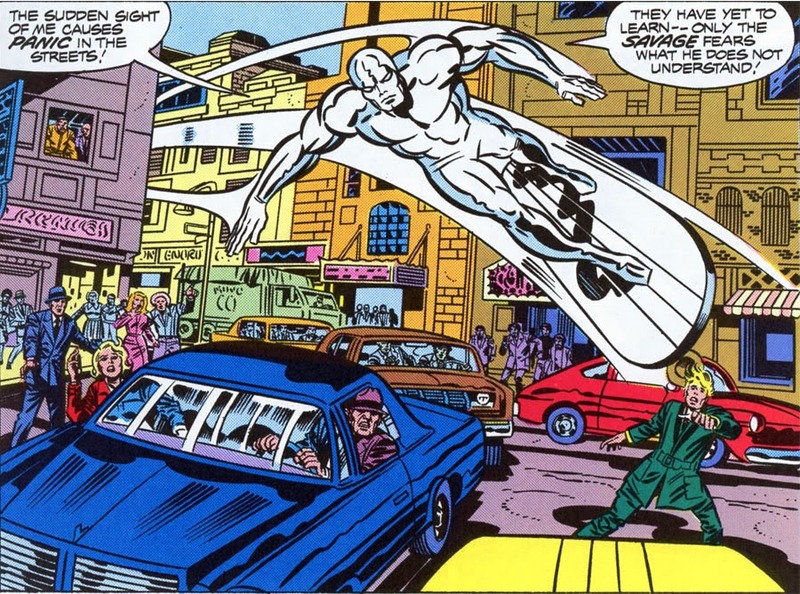 But while in the latter story the Surfer's focus shifts to (who else?) 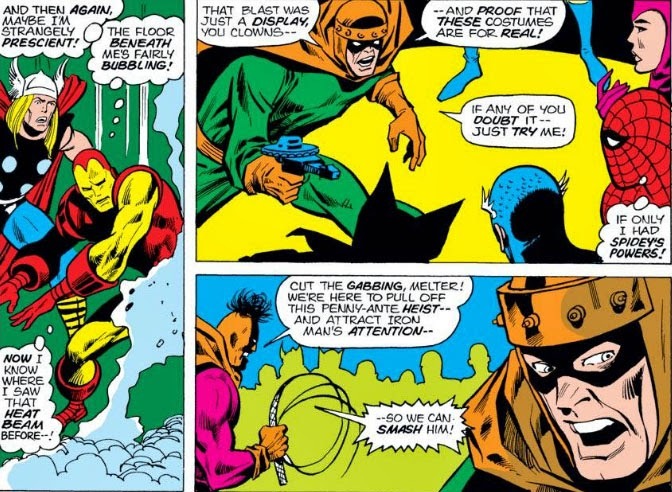 Mephisto, here the story centers solidly on the Surfer and Galactus, and whether or not they can come to terms. With no other Marvel characters to play off of, the story must eventually come down to the two of them--and in the middle of their tug-of-war is the human race, and two questions: Can it be saved? Should it be saved? 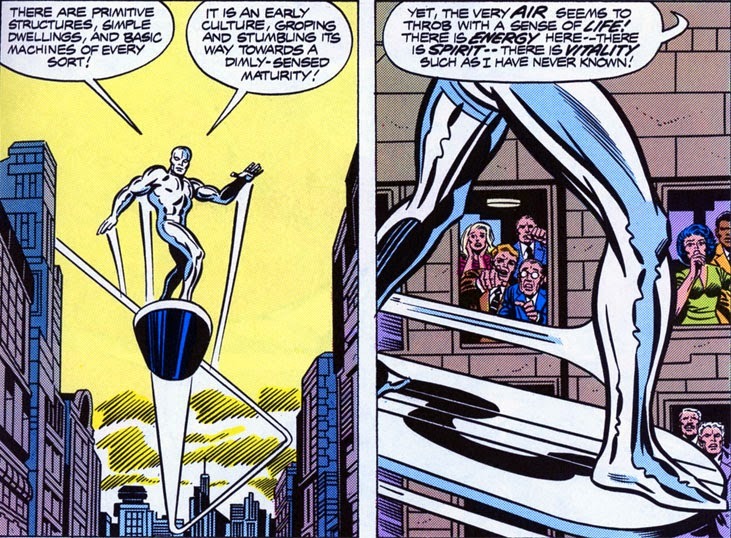 Putting aside for the moment the burning question of why the heck the Surfer didn't make these plaintive arguments on any other inhabited worlds Galactus was about to wipe out, their exchange is an interesting study in contrasts. 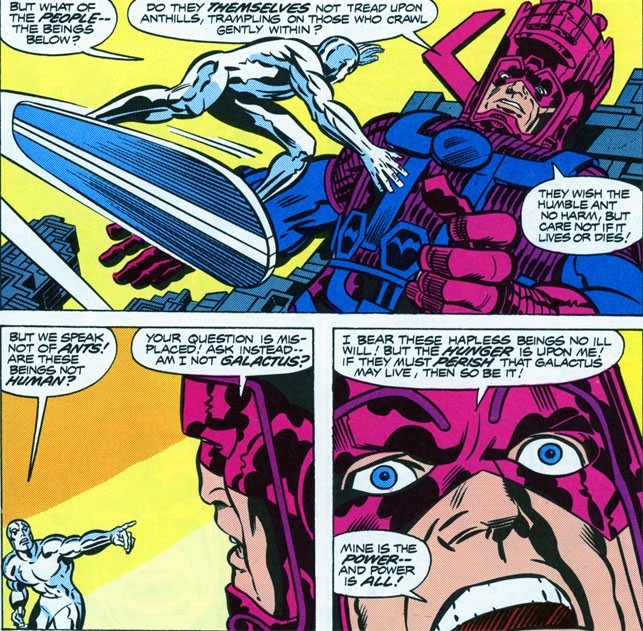 The Surfer is obviously impassioned; yet Galactus tends to speak in absolutes. Lee tends to go overboard a bit when he tacks on "...power is all!" to Galactus' argument, since it can come across as insane ambition if spoken by anyone else bent on destruction; but the point is that Galactus depends on these worlds for survival, and to him there is no other choice. I've sometimes wondered: with all of that advanced equipment he has access to, has Galactus even tried to investigate other options for his survival? With the way Lee writes him, as being so above-it-all, it seems doubtful. 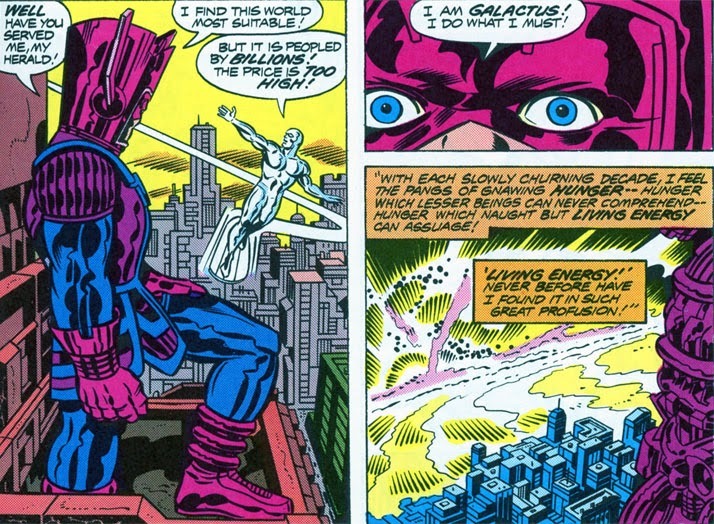 He's Galactus, this is what he does, and that's that. But for the Surfer, the discussion is far from closed--and the dramatic moment we've been waiting for has arrived. Yet this was Dr. Doom's first use of the ability he learned from the alien Ovoids--the power to switch bodies with someone. 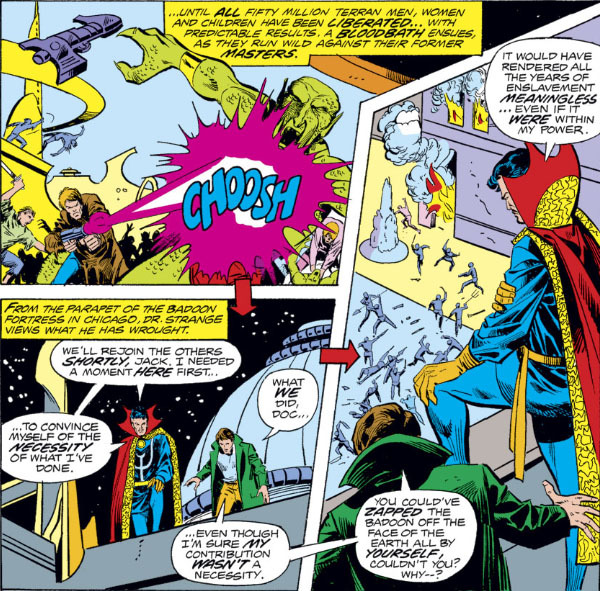 And so, in this instance, it's the good Doctor who is leering in triumph at the perfect execution of his plan to switch with Reed, while Reed (in Doom's body) is attempting to convince his teammates of his bona fides. In other words, we were robbed. Evil Reed would become a reality, though, when the Over-Mind takes control of him and summons him to his side. The Thing begins to suspect the truth--but Evil Reed doesn't give anyone the chance to put two and two together, and quickly distracts everyone's attention by making a break for it. Finally, someone has the good sense to contain Reed, rather than continue to try to out-fight him. And it's then that the FF see who it is they're dealing with, and that Reed has fully joined the Dark Side. And escape he does, joining the Over-Mind in battle against his former team--a team which will ally itself with, of all people, Dr. Doom, in an odd sense of symmetry with that earlier issue. 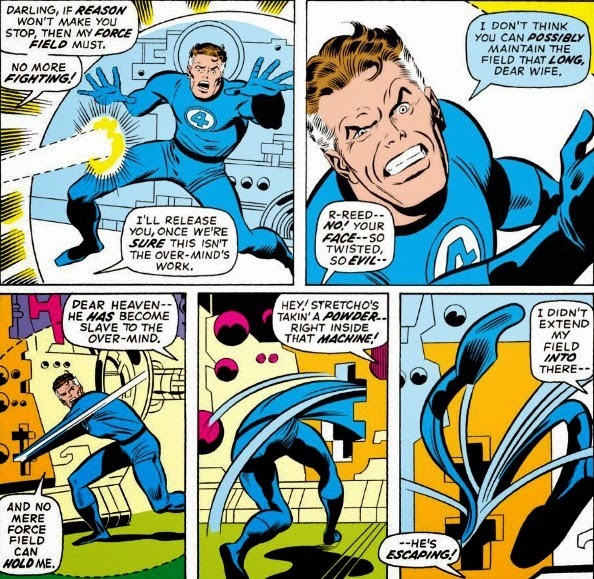 Unfortunately, we don't see Evil Reed reappear during that battle, but Whipped, Confused Reed, a shadow of the calculating, conniving trash-talker we see here--probably because the FF would have their hands full with the Over-Mind, and Evil Reed would have been too formidable a foe if teamed up against them. But, good grief, do I have to think of everything? 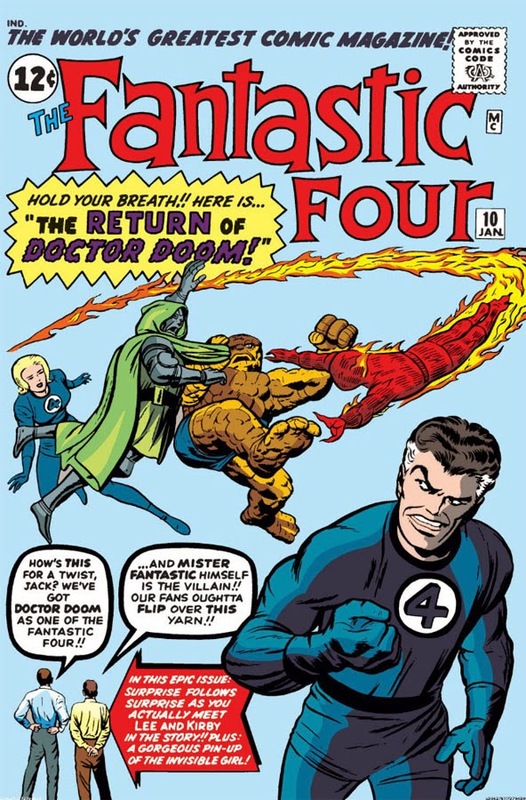 Why not have Evil Reed double-cross the Over-Mind and figure out a way to sadistically get rid of him, leaving the FF and Doom to face Evil Reed for two or three more issues? Think of the drama of Evil Reed unleashed, going toe-to-toe with Doom without an ounce of normal-Reed's restraint. Just the insults and arrogance flung between the two of them would be worth the price of the issue. Sub-Mariner #56 remains one of my all-time favorite issues of Namor's first series, though with only 16 issues remaining until the title would be cancelled. It's a feast for the eyes in every way, from its beautiful opening splash page to its tragic ending--with Dan Adkins stepping aboard to do the full artwork, accompanying a surprisingly thoughtful and riveting story by Mike Friedrich. 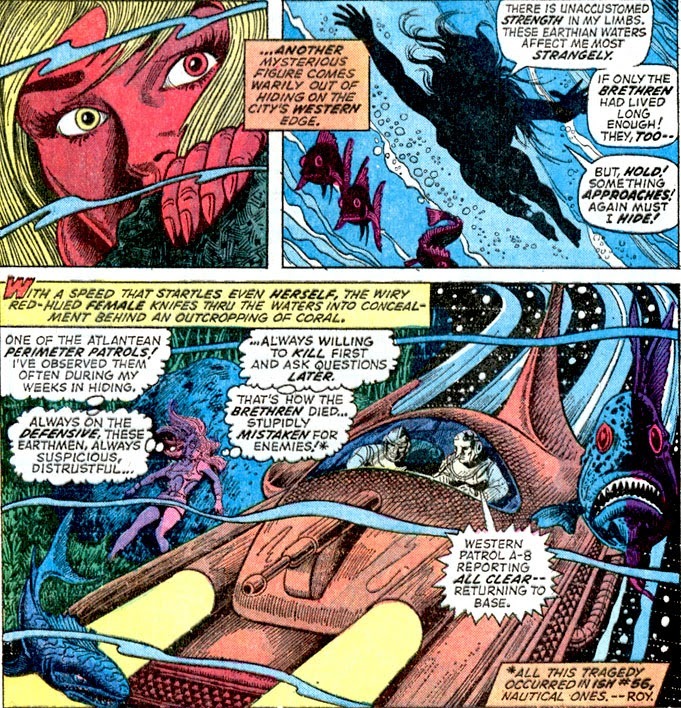 Since he abdicated his throne and effectively veered away from any course writer Roy Thomas might have been charting for him, the Sub-Mariner, like his former kingdom, has been at loose ends, with no real direction and certainly less involvement and influence as far as the surface world is concerned. We'll see in this issue that, despite the listless feeling his book conveys to readership, Namor relishes that freedom--but for such a man, turning his back on his responsibilities can come at a steep price. For a writer new to the book, Friedrich shows a (I must use the word again) surprising grasp of the Sub-Mariner's character--not just his strength of mind and body, but his uniqueness among Marvel's other heroes, as well as where he currently stands in his book as far as his state of mind. No small credit must be given to Adkins, who plotted this story which has given Friedrich so much to work with; but the Namor in this story, as written by Friedrich, comes across as a very interesting comics character, one who seems more than capable of supporting a solo series. 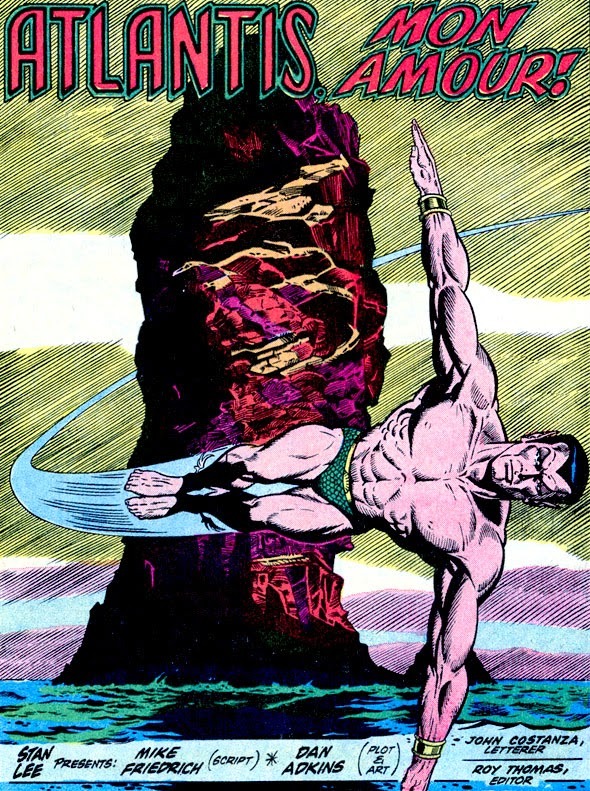 Namor has been absent from his kingdom for almost twenty issues at this point; yet, given how at ease he seems in his self-exile and isolation, he gives the impression of being quite ready to go another twenty, if not more. Once you've turned the last page in this issue, you'll probably find yourself wishing that Friedrich and Adkins had extended their stay, at least long enough to give the Sub-Mariner new direction. In the spirit of full disclosure, though, Namor's indulgence in his self-sufficiency in this story's beginning is Friedrich's way of laying the foundation for what's to come. 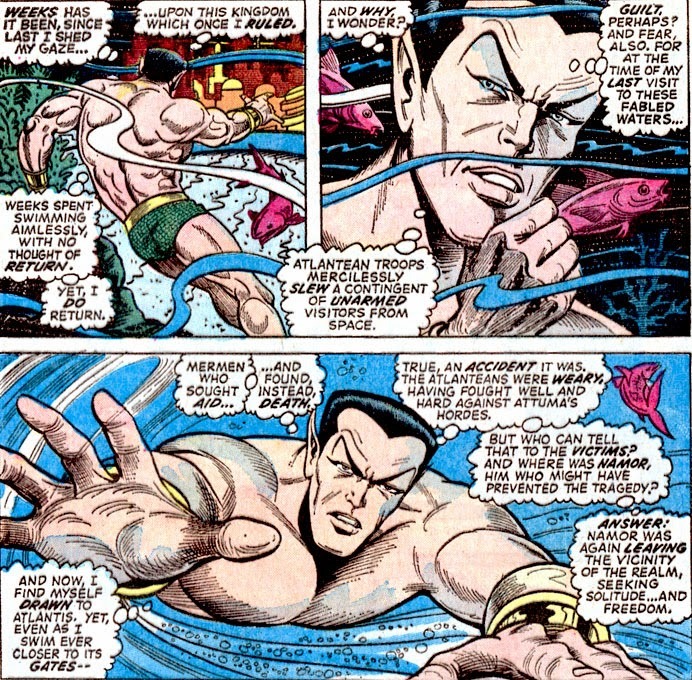 Atlantis has never been necessary for Namor's evolution as a character--but as we'll see, it can still work well with Namor under the right circumstances. It is, after all, part of his history and heritage--much as Namor would like to avoid admitting it, at least for awhile. 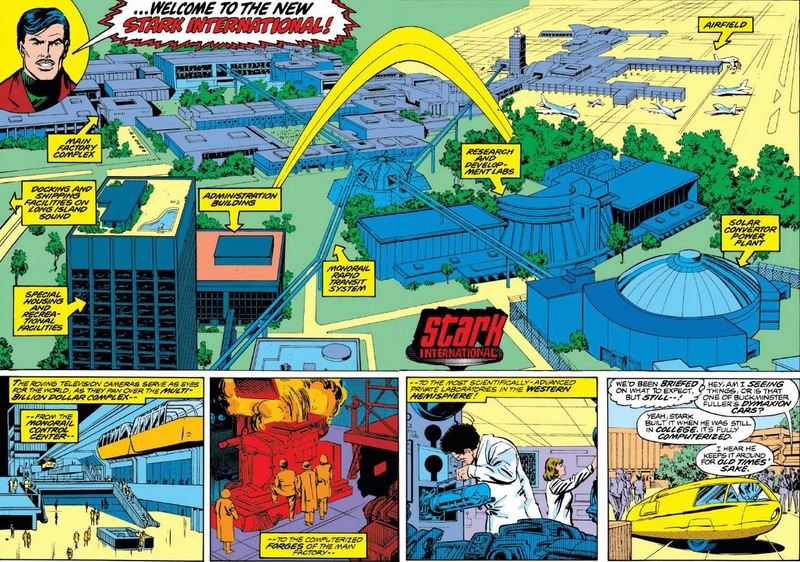 It was only when the company was completely rebuilt after the villain Midas had bulldozed and renovated it to his own vision when Stark International received a full unveiling to the world, formalizing its shift from munitions manufacturing to R&D. 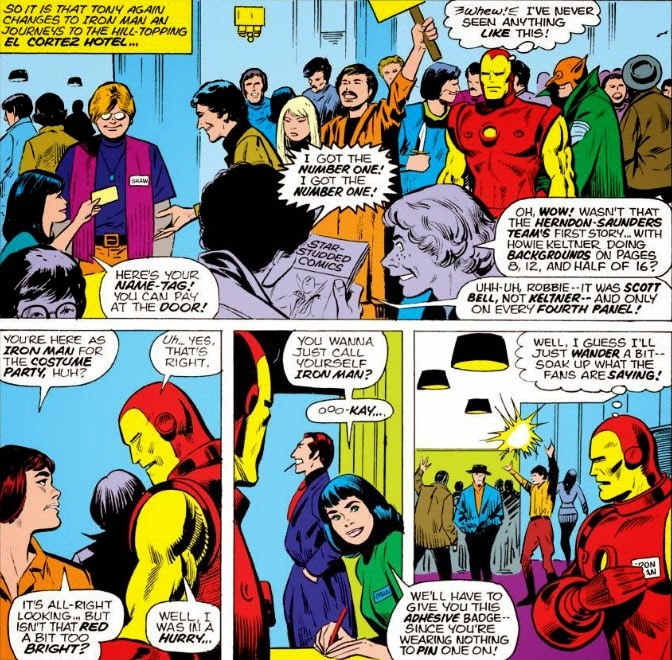 "Midas International" was then replaced with an all-new complex, heralding the end of Stark's long and stressful period of "reordered priorities." Have a look at this two-page spread of the new company by artist Keith Pollard (with inks by Joe Rubinstein). Welcome to the future, Mr. Stark! What's this? 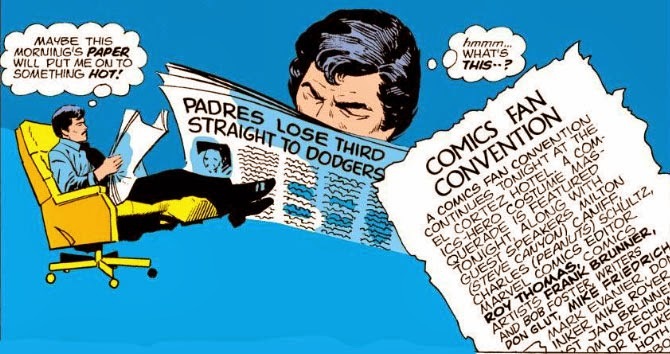 Tony Stark is looking for something crazy to do in San Diego?? You and I have just the thing! Good thing he's already got a custom-made costume handy. "This," of course, is the unexpected appearance of villains--namely, the Melter, Whiplash, and Man-Bull. Unfortunately, they're not simply convention-goers dressed in costume. 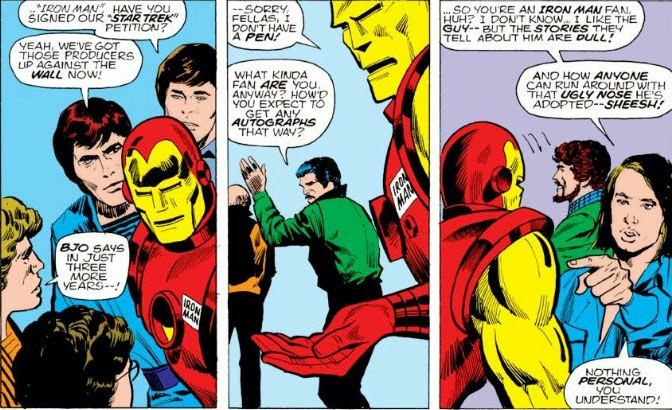 Iron Man doesn't have an easy time dealing with these three, but eventually they're shown the door. 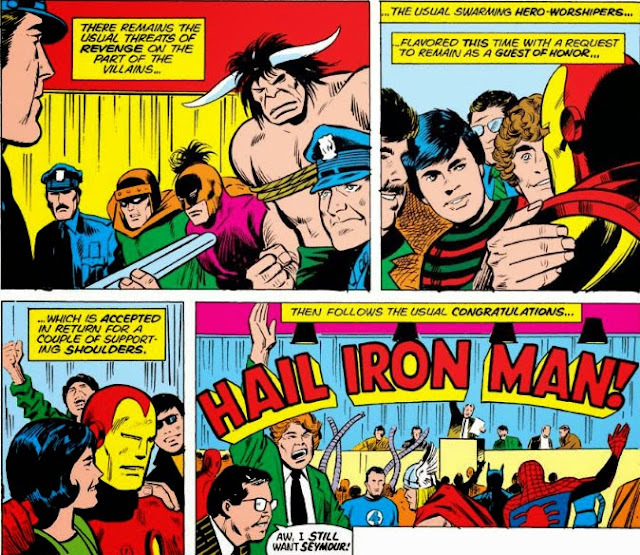 And as a result, Iron Man gets quite a different reception from when he first walked in. Since we can assume, judging by the artwork, that the shield isn't wedged into the truck's front fender or any other part of the truck, there's got to be something else holding it in place, right? Especially with the force of the street plus the tire's rotation putting pressure on it. 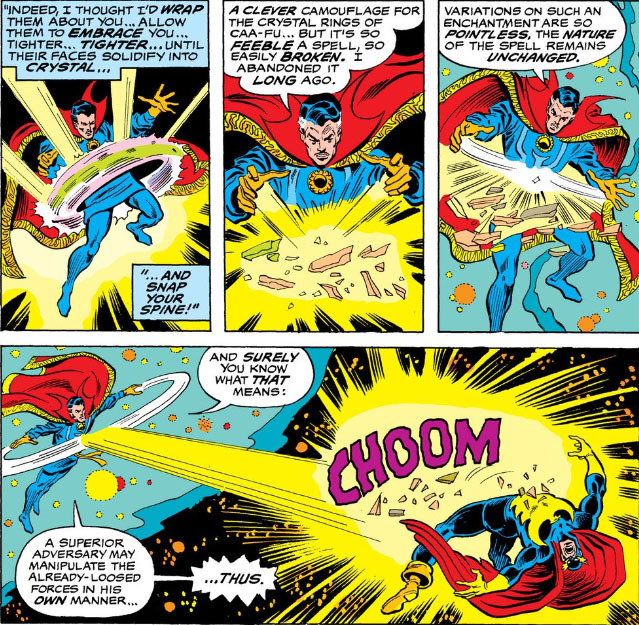 a) Magnetic properties left over from Tony Stark's tinkering? b) Extendable spikes that allow it to clamp onto a target? c) An anti-centrifugal coating that resists a spinning tire's ability to fling it away on contact? 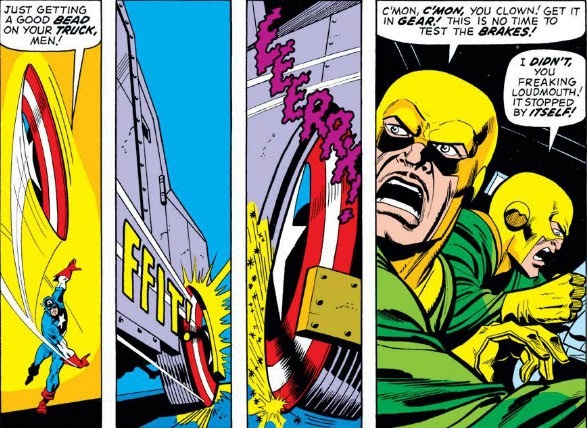 d) Hidden mini-nozzles that release the Trapster's paste when Cap touches a stud on his glove? e) The ability to adapt and adhere to the size of any tire on contact, thanks to a hex from the Scarlet Witch? For what it's worth, I doubt the answer would have helped the two hoods driving this truck. They sure don't seem like the type who would read comics for fun. Now that we're finally--finally!--done with Winter and we've formally welcomed Spring, I'm afraid I'm one of those who have a house to tend to and outdoor chores to take care of. This Winter has been a brutal one, hasn't it? I couldn't be more glad to kick it to the curb. But now there are weeds to pull, leaves to rake, garden equipment to check out, crowds to navigate around at home gardening centers, and bedding to lay down around the shrubs and various plants that are coming out of their long dormancy. Maybe I should let the guy on the left handle all of it for me. Yeah--Dr. Strange, to whom home chores must be little more than a trifling concern, even if he had a yard or any other home-centered tasks to be concerned with. But sometimes it seems like he takes that attitude with the threats he deals with. That bar fight he so quickly dispensed with has me thinking of all the other cool times he's swept in and just taken care of a foe or a crisis situation with a shrug. 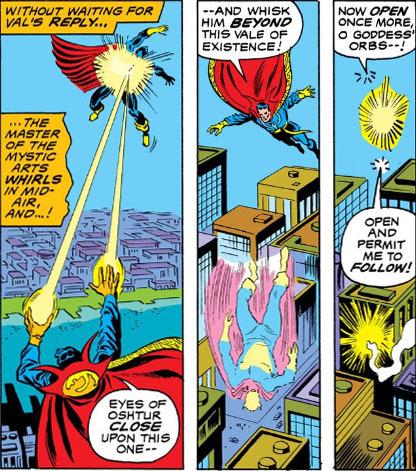 Strange has had more than his share of formidable enemies to contend with, no argument; but on the other hand, it's often amusing to see him deal with those opponents who aren't quite up to the task of taking him on. Cyrus Black was one such hapless opponent, even though Black was resourceful at supplementing his power by other means. Let's have a look at a few who weren't so lucky. I suppose if I could take a starship and place it in orbit, as well as transport it and all aboard to the 31st century without so much as breaking a sweat, I'd be feeling pretty cocky, too. 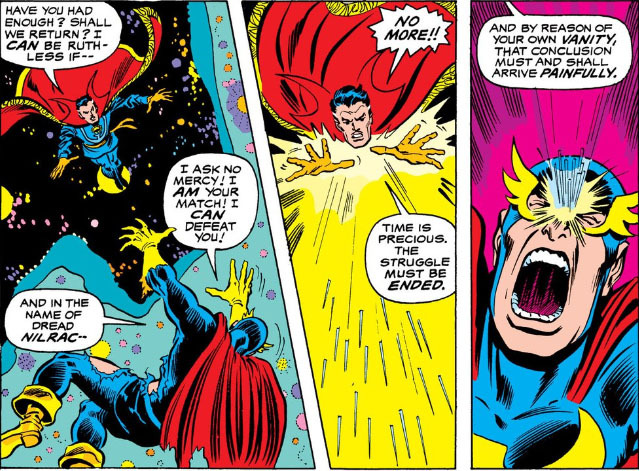 Strange gets a little sidetracked during this adventure with the Defenders and the Guardians, but when he's ready to save the Earth all by himself act he doesn't waste any time. Wait a minute--is this guy really off to save the planet, as if he were running a minor errand? Heh. "...even if it were within my power." Obviously, it is. But to Dr. Strange, they're just so much trash to take out. There aren't a lot of guys who can just swoop in, take aim at Galactus, render him catatonic, and call it a day. Gosh, it seems fitting that Strange ends the battle by choosing to punish Chondu for his ego, after spending the majority of it tapping into his own, eh? The Monarch And The Mystic! 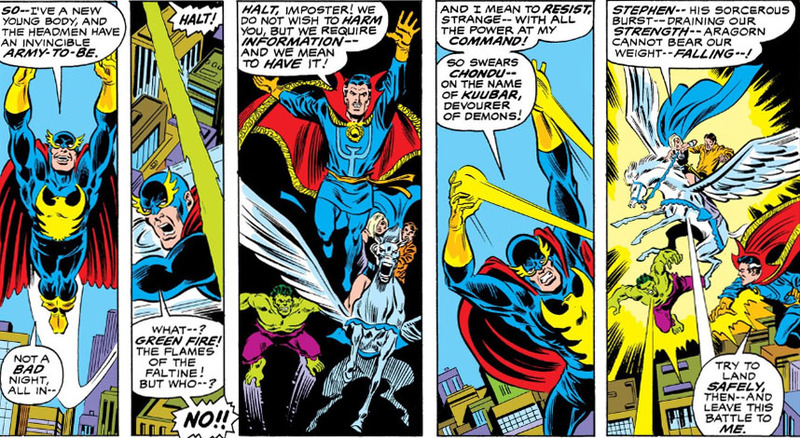 Would You Believe--The Howling Sorcerer Supreme!? Ten Tales Of Terrible Titles!